I was mildly disturbed to read Yadavendra Dasa’s “Treacherous Intervention” posted March 19th in the Sampradaya Sun. Yadavendra Prabhu notes that in the two editions of Bhagavad-gita As It Is (1972 and 1983) the text of verse 4.23 differs from Srila Prabhupada’s typewritten text in the original manuscript. He notes that the original manuscript uses the words “a person” whereas both of the two published editions uses “a man”. He concludes that this is highly sexist, and he argues that the editors must have been on the bodily platform, influenced by male pride and have misinterpreted Srila Prabhupada’s words. Yadavendra Prabhu’s conclusion can be immediately falsified if we can find an instance where Srila Prabhupada uses the word “man” (in his translations, lectures and purports) in the same sense that it is used in the two published editions of Bhagavad-gita As It Is 4.23. A search on the Vedabase, and in the original manuscripts reveals that there are indeed instances where Srila Prabhupada uses the word “man” in precisely that same way. We find it in for example Bg. 2.70, 4.39 and 6.7. Srila Prabhupada gave lectures on all three of the above-mentioned verses, and he did not complain about their wordings. The word “man” is used in all of these three verses in both the 1968 and the 1972 edition, and we know Srila Prabhupada said they could keep the verses of the 1968 edition in the 1972 edition. He must have been satisfied with them. In Srila Prabhupada’s purports the word “man” or “men” is used in a similar sense (as in the two published editions) hundreds of times. It is very easy to find them by doing a search on the Vedabase. This disproves Yadavendra Prabhu’s idea that it is sexist to use the word “man” like it is used in the two published editions – unless he wants to argue that Srila Prabhupada was sexist. But his point is precisely that Srila Prabhupada was not sexist, but that the two editors were. I guess my point is that if we want to criticise Srila Prabhupada’s editors we must first do our own research properly lest we make fools of ourselves. We are gradually producing videos on the book changes. Check our playlist at Youtube, and remember to subscribe for new videos. Kindly share the videos on social media – especially on Facebook. Thanks for watching and helping Srila Prabhupada. I had a few exchanges with Kripamoya Prabhu (ACBSP & GBC) on Facebook. The exchange speaks for itself. I did not leave anything out. Kripamoya Prabhu did not respond. Later, in another exchange, Kripamoya Prabhu stated that he could not accept a devotee’s criticism of ISKCON, because the devotee posted anonymously. I responded by referring to the above exchange where I posted non-anonymously, but where he, Kripamoya Prabhu, still did not respond. 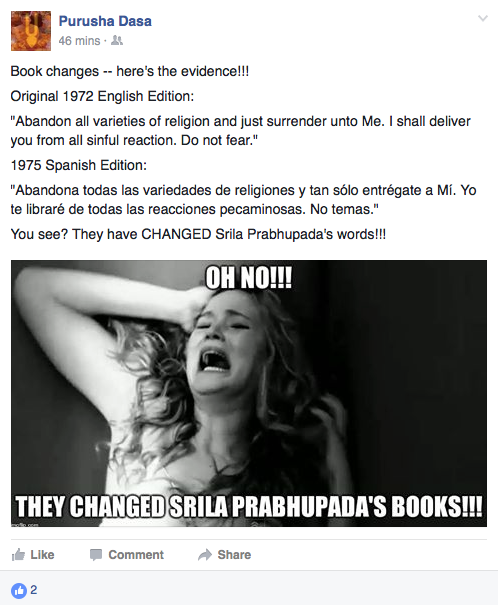 Translations into foreign languages presents no problem for those against changes to Srila Prabhupada’s books. Because such translations do not present themselves as the original words of Srila Prabhupada. 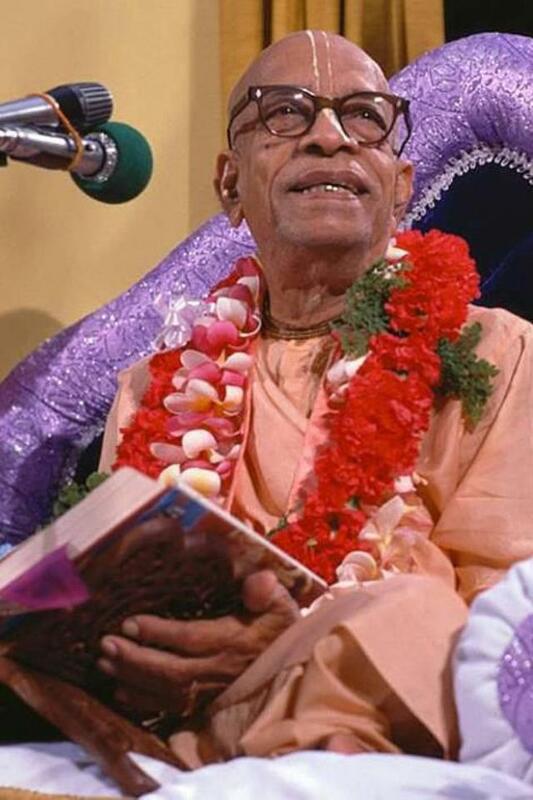 Instead they present themselves as foreign translations of Srila Prabhupada’s words, and everyone knows that such translations come with some problems. But you can always check the foreign translations against the original English editions. On the other hand, the unauthorized, changed books from BBT International present themselves as Srila Prabhupada’s original words, even though they are not. And BBT International wants to eliminate the original editions so that any comparison between the originals and the changed editions is impossible. Now that is a problem.